Harrell Fletcher, who recently created the campus-wide art project Collective Museum with the Portland-based art group Public Doors & Windows, will return to UC Santa Cruz on August 28, 2016 as keynote speaker for the sixth annual Farm to Fork benefit dinner. The annual event raises scholarship funds to support the Center for Agroecology and Sustainable Food Systems (CASFS) apprenticeship program that trains new organic farmers and gardeners. Fletcher graduated from the apprenticeship in 1996. Farming is part of Fletcher’s roots. For more than 30 years, Fletcher’s grandfather Lee was farm foreman and superintendent of Cal Poly’s Farm Shop. His family tended large gardens in their backyard. As an art student in Oakland he volunteered at community gardens. But when the budding artist came to the 30-acre organic farm and garden in 1996, he immediately knew it was going to be unlike any of his other farming experiences. “First of all you brought your own tent,” Fletcher remembers. Until 2009, apprentices would pitch tents in the trees lining the fields where they would live, learn, and work together for the next six months. The idea is that one develops a hyper awareness of the habitat’s ecology: essential skills for a farmer. But as Fletcher points out, also for artists. The program’s philosophy of connecting people to their environment was instrumental in shaping Fletcher’s approach to art and teaching, he says. Since graduating from the apprenticeship 20 years ago, Fletcher has established an international reputation for creating site-specific art that considers the interrelationship between the piece, the people, and the place. 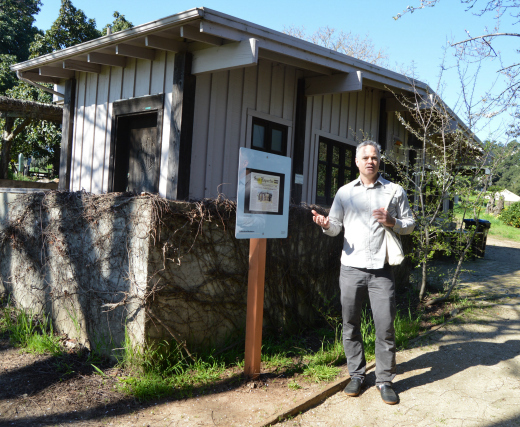 He says his appreciation for site-specific methods grew out of his experiences at the UCSC farm. Fletcher shares that he approaches art projects much in the way that an organic farmer would tend to new crops. Just as a farmer examines their landscape–soil condition, weather patterns, seed variety, consumer interest, tradition and more–an artist, too, must consider the holistic factors that surround and situate their work. Art becomes accessible when the artist connects to the audience, says Fletcher. While apprentices now sleep in canvas tent cabins reminiscent of Yosemite’s Curry Village, the immersive environment is a tradition that continues today. Cooking, cleaning, and other domestic responsibilities are shared. Meals are eaten family-style at a communal table at the Farm Center kitchen. “The cohort itself is significant,” says Fletcher, who remembers learning as much from his colleagues as he did from his teachers. While he later pursued an art career, the program’s emphasis on community-building influenced Fletcher and his artistic practice for the two decades to follow. Collaboration is a big part of the apprenticeship experience, Fletcher remembers. It made sense for him to pursue art in the same fashion. Instead of seeing art as a generic object that can be displayed in any white-walled gallery, why not create work in, for, and by the community, he says. Connecting people to places is a central theme of the Collective Museum, Fletcher’s newest body of work, now on display at UC Santa Cruz. The project reimagines the campus as the museum. Through physical signposts,a mobile website, a catalog, and map, it draws attention to 50 sites across 2,000 acres that carry significance and meaning to faculty, staff, students and alumni. Seven sites are located across the 30-acre farm and 3-acre Alan Chadwick Garden. The Collective Museum includes contributions from notable CASFS alumni including Cathrine Sneed of the Garden Project and founder of the San Francisco County Jail Horticulture Project (1982-1992), a horticulture training program for inmates and at-risk youth. “Harrell's skill at making connections between lived experience and art is inspiring,” says alumna Melissa Betrone. She is now the farm program’s Outreach and Recruitment Coordinator and also contributed to the Collective Museum. Also participating in the project are Nancy Vail and Jared Lawson of Pie Ranch, the educational farm and organization that teaches high school students and adults about food systems, food justice, and sustainable food production. It was Vail who first told Fletcher about the apprenticeship program at UC Santa Cruz and attended the program in 1997. Fletcher received his MFA from the California College of Arts & Crafts in 1994 and a BFA in Photography from the San Francisco Art Institute in 1990. Along with his work as a member of Public Doors & Windows, he has collaborated with filmmaker, performance artist and writer Miranda July, who spent two years in the 1990s as an undergraduate in the arts at UC Santa Cruz. His work can be found in the collections of MoMA, The Whitney Museum, The New Museum, SFMOMA, The De Young Museum and 50 sites across the UC Santa Cruz campus. Farm to Fork will be Sunday, August 28 at the UC Santa Cruz Farm and historic Cowell Ranch Hay Barn. The meal will be prepared with ingredients from the farm by Amy Padilla (also a CASFS alumna) and Heidi Schlecht of Feel Good Foods. An on-farm reception and tours, including a tour by Fletcher of several Collective Museum installations on the farm, will begin at 3 p.m., with dinner at 5 p.m. in the newly renovated Cowell Ranch Hay Barn. For more information and tickets, please visit http://specialevents.ucsc.edu/farmtofork.